The Murder Act of 1752 could have created a major new supply line for the hard-pressed anatomy teachers of England, Wales and Scotland. By making it compulsory for all fully convicted murderers to be not only executed on the gallows, but also either publically dissected or hung in chains on a gibbet, the Act could have been a major boon to the rapidly growing ranks of surgeons and anatomy teachers to be found not only in London and Edinburgh but also in other major cities such as Leeds and Newcastle. But it didn’t happen. Over the entire period between 1752 and the Anatomy Act of 1832, which effectively repealed all the relevant clauses of the Murder Act, an average of only 12 criminal corpses were sent each year to the surgeons of England and Wales. There were fluctuations of course. In 1817, during the period of massive demobilisation which followed the end of the wars with France two years earlier, 24 corpses were made available. In three wartime years 1781, 1804 and 1806 only 3 corpses were sent to the country’s surgeons. (The correlation between peacetime and higher murder rates and wartime and lower ones is a separate subject –comments welcome.) On average London’s surgeons received two bodies a year between 1752 and 1832. In the 1820s, when we know they required at least 500 corpses a year, the average was one criminal corpse a year. This does not mean the corpses that were sent were not useful to the surgeons and often lucrative into the bargain. This was one of the reasons why some provincial surgeons mobilised the help of Wilberforce in the 1780s in an unsuccessful attempt to make it compulsory for highway robbers bodies and those of other serious property offenders to also be released to them. (This is a little known aspect of Wilberforce’s career which is rarely given space in biographies of the great anti-slave trade campaigner but has been brilliantly investigated by another member of the project team – Richard Ward.). Why then were supply levels so low? It was not because the judges usually chose to gibbet convicted murderers rather than dissect them. Even at the high point of gibbeting only about a fifth of sentences stipulated that the criminal’s corpse be hung in chains. Moreover no women were gibbeted. All were dissected for reasons that were never made clear (any thoughts?). Neither was it necessarily because there were very few murder accusations. Murder indictment rates did fall in the 18th century (the reasons for this are a source of great debate) but there were actually a much much greater number of offenders prosecuted in the courts for murder than the small body count described above would imply. No. 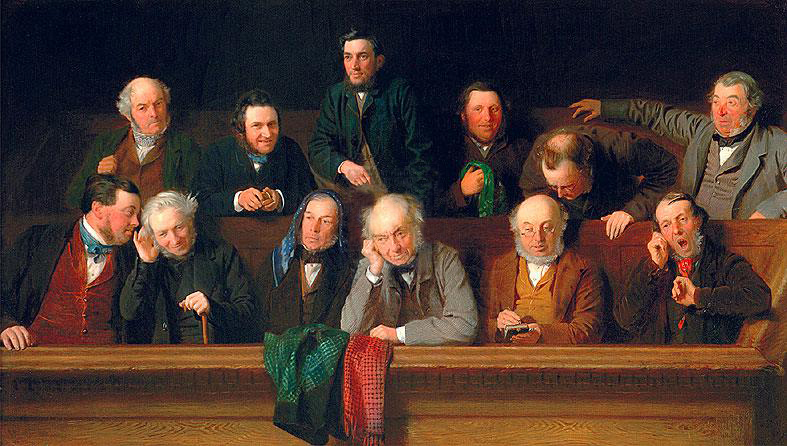 The answer lies not with the judges but in the behaviour of trial juries such as the one illustrated here. In London, for example, if the jurors of the Old Bailey had not been extremely lenient in the series of decisions they made during murder trials, London’s surgeons would have had much greater reason to be pleased that the Murder Act had been passed. Between 1791 and 1805, for example, only 15 out of more than a hundred men and women accused of murder in London were actually executed. One in ten were sent to be tried in courts in other counties or released because their prosecutor failed to turn up, one in eight had their indictments dismissed by the grand jury, and well over a third of those that were sent on for public trial after the private grand jury hearing were subsequently acquitted by the public trial (or petty) jury. Only two fifths were therefore convicted. Moreover, two thirds of that two fifths were not convicted for murder but only for the non-capital offence of manslaughter. A very similar pattern occurred in the county to which I have just retired – Cornwall. Here between 1770 and 1824 only 12 per cent of murder indictments ended in a sentence of death. 10 per cent were not found, 45 per cent were acquitted and 33 per cent were found guilty only of manslaughter. The other county we have data from – Durham executed only 15 per of those indicted for murder. Why was it so easy to get away with murder in eighteenth century England? Many murder indictments in the eighteenth century arose either from cases in which the victim had been killed unintentionally during a fight ( see below) or from other contexts in which there had clearly been no premeditated intention to kill, and jurors were therefore very reluctant to bring in full convictions (or often any conviction at all) in such cases. It was therefore remarkably difficult to get yourself hanged for murder in any region of eighteenth-century England and Wales and particularly in Cornwall which had a long record of resisting the State’s attempts to impose laws that local people were not in tune with. The relatively small number of cadavers made available by the Murder Act mainly reflected the power jurors had to either acquit or bring in a partial verdict, downgrading the initial murder accusation to one of manslaughter which rarely resulted in more than a year in prison. The jurors of eighteenth and early nineteenth century England also used their power to downgrade the charge to prevent large number of burglars, house breakers etc. from being hanged. They effectively told the courts and the Parliament that passed the bloody code (which made so many minor thefts into capital offences) that they did not agree with the law and intended to deliberately undermine it by adjusting their verdicts to prevent the offender being executed. This was a vital function and remains one today. When our government quietly legislates to take away the right to jury trial from various categories of offenders we need to remember that the jury is in court to make a judgement about 2 things. the guilt or innocence of the accused. the appropriateness of the law and the penalty it attaches to particular acts. When in the 1790s the government made it a treasonable offence to publish anything that advocated that every adult should have the vote (or at least every adult male!) the Old Bailey juries refused to convict. In doing so they passed judgement on an oppressive law. We need that same check now and will almost certainly need it in the future. Governments find it inconvenient and try to pretend that juries are too expensive or unpredictable. They are however, the place where the people have the chance to make a judgement on the rightness of the law. We need to be aware that once that right is eroded it will be hard to get it back. Peter King is Emeritus Professor of History, University of Leicester. His main areas of research are crime, justice and the role of the law in English society 1700-1860, and poverty, the poor law and the strategies of the poor. He leads the Criminal Justice System strand of the Harnessing the Power of the Criminal Corpse Project.